After gaining up to 6 per cent in past two months, mid-and small-cap stocks lost their sheen in calendar year 2019 (CY19) with both the indices falling 7 per cent each in January compared to one per cent rise in the S&P BSE Sensex. Earlier, in September 2018, both these indices had tanked 12.5 per cent and 16 per cent respectively, while the S&P BSE Sensex had slipped 6 per cent. The underperformance comes amid liquidity concerns in the non-banking finance companies (NBFC) space and Essel Group default news. Despite the sharp fall, analysts say there more pain in store for these two segments over the next few months and suggest investors remain selective while investing. Deepak Jasani, head – retail research at HDFC Securities, for instance, expects the S&P BSE mid-cap index to slip to 13,400 from 14,400 currently. Even though the slide in the S&P BSE Small-cap index may halt temporarily, the overall trend, he says, still looks weak and the index can after a bounce slip to 11,800 levels from 13,700 levels now. “Disruption due to changes in regulation, technology, absence of entry barriers and difference in access to liquidity got accelerated due to demonetisation, GST (goods and services tax) implementation and Real Estate (Regulation and Development) Act (RERA). This has impacted the companies, especially in the small and mid-cap segment that are slipping in terms of their market share, revenue growth and margins. This is likely to continue for some more time till the weak ones among them gets eliminated and there is some consolidation,” he says. Out of 962 stocks from these indices, total 414 stocks have seen their market value drop over 10 per cent thus far in January. 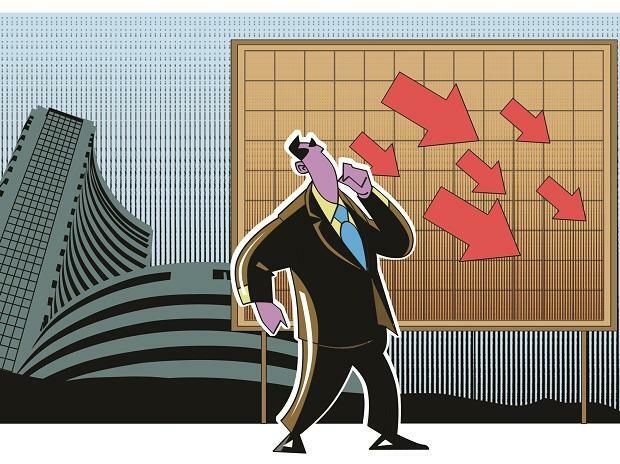 Of these, 16 stocks have slipped over 30 per cent, while 73 stocks skidded in the range of 20 to 30 per cent. Promoter’s credibility and corporate governance are another issues that have impacted sentiment, analysts say. For instance, Essel Group companies – Siti Networks, Zee Learn and Zee Media Corporation – from the mid-and small-cap segment plunged up to 36 per cent at the bourses, after reports suggested that its promoter company was allegedly involved in laundering money immediately after demonetisation. The sharp fall last week, coupled with the financial trouble at the Zee Group, had raised concerns that lenders would be forced to liquidate their holdings. The management, however, has allayed investor concerns since then. “Corporate governance norms practiced by most companies in the mid-and small-cap segments have been poor so far and that has impacted valuations in a big way. There is a gap in the promoter’s intent and action. There is also a question on the competence of some promoters in these trying times. Despite their valuations becoming attractive, investors are choosing to stay away from such counters,” Jasani adds. G Chokkalingam, founder and managing director at Equinomics Research, too, expects more downside in these two segments. “The fall will separate wheat from the chaff. Companies with strong balance-sheet, good governance and solid promoter backing will still find takers. One needs to be careful while investing,” he says. From a long-term perspective, however, Jyotivardhan Jaipuria, founder and managing director, Valentis Advisors expects the mid-and small-caps to outperform the large-cap peers in CY19. “The early part of the year may continue to see weakness in mid-caps that provides better buying opportunities,” he says.